“People like it when you talk pretty . . . they like the bounce of it.” Miles (Rafael Casal) tells this to Collin (Daveed Diggs) after selling an old sailboat in a flurry of words. Miles and Collin are both best friends and movers. The pair sort through the belongings of homes in Oakland, some long-abandoned and about to be stripped of all that once was. Here they find a family photo album, a football, broken furniture, all of which finds its way to the trash pile. Caught in the middle of a city in flux, Miles struggles to provide for his family, while Collin attempts to uneventfully serve his last few days on parole. 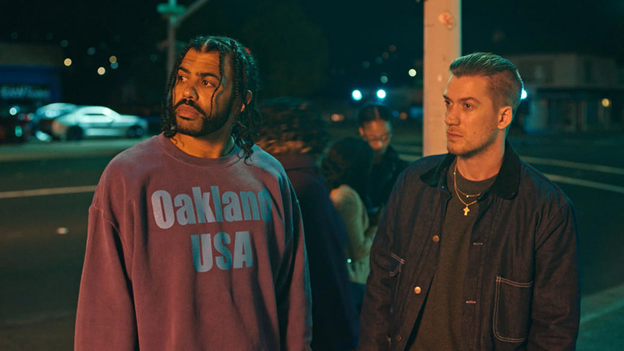 The apathy for old Oakland culture and communities, and the privilege which allows this to happen all remain at the core of BLINDSPOTTING’s messaging. Casal and Diggs craft the film as a stylized drama of empathy, verse, rhyme, and rhythm, impressively peeling back the multi-layered complexity of an enormously complicated world. Casal made famous through national spoken word and poetry competitions, and Diggs from Lin Manuel’s HAMILTON, both utilize their innate, poetic aptitude in the film. Similarly to HAMILTON, Diggs and Casal mention in various interviews that they had initially conceptualized a film all in verse, but later decided against it. Instead, the various sections of verse serve as the film’s foundation, while the script was written over the course of at least five years. Certain events like the shooting of Oscar Grant III in Fruitvale Station changed the story to reflect additional themes. Vegan food, “green juice,” and hipsters with native Oakland tattoos also reflect this gentrification more mildly and serve up a more palatable combination of exposition and comedy. After all, their lives often seem impossible, but they find time to laugh at their hardships as best friends. With the rapid changing of Oakland culture, Miles and Collin’s identities are constantly called into question. As a black, convicted felon, Collin feels judged by his identity, while Miles feels the need to compensate for his whiteness. As much as the film is about Oakland’s struggle to preserve its figurative roots, it’s as much about getting the two friends to honestly talk about themselves. A small scene involves Patrick (Wayne Knight), a photographer, who superimposes oak trees on new developments to remind people of the city’s past. He unsuccessfully attempts to have Collin and Miles engage with each other, and defeatedly looks on as they’re tasked with packing up his art gallery for an unknown destination. But Diggs and Casal’s artistic venture into this conversation is more effective in its comprehensiveness. While the oak tree is a distinct symbol, it doesn’t necessarily define all there is to appreciate about the city despite some of its uglier aspects. In fact, Collin calls out this distillation of Oakland culture in a fervent scene of verse, where he explains that he has to speak this way in order for white people to listen, as if rap is Oakland’s only valuable export. It seems Casal and Diggs felt the need to make the film for this exact reason. The way that outsiders marginalize Oakland seems to be at the root of police violence, gentrification, and indifference towards the people who reside there. At times, Diggs and Casal sacrifice this depth for comedic relief, resulting in slightly cheapened drama. That being said, the technique of utilizing humor to address darker issues isn’t surprising. Director Carlos Lopez Estrada employs disturbing montages and scenes that are uncomfortable and, at times, horrific. So humor is often welcome throughout the film, and has the similar effect that Miles has when he talks pretty to loosen up customers. Despite this deflection, the film is also bold, current, and takes advantage of film as a visual medium in a relatively straightforward, but effective way. Diggs and Casal throw everything they have at the film, from their solid acting to clever banter and general poeticism. 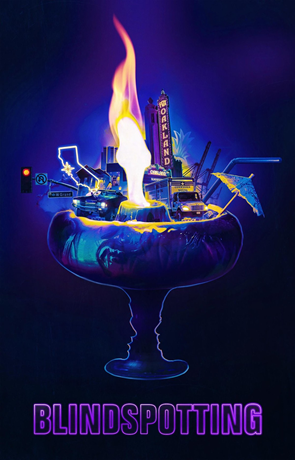 Go into BLINDSPOTTING with an open mind, and through its minor tonal inconsistencies there is a film well worth your time.